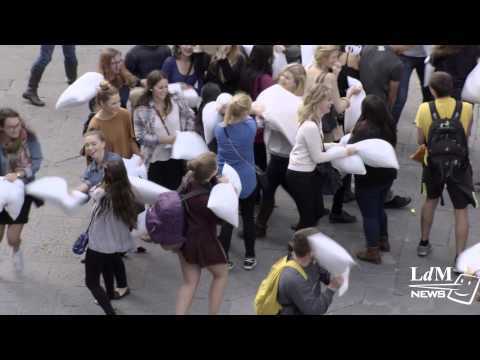 Over 80 people showed up for the first ever Pillow Fight Flash Mob hosted by The Florentine English-speaking magazine. With the scenic surroundings of Piazza del Duomo as a battleground, the fight was simply, old-fashioned fun! The staff of The Florentine served as the referees and enforced the only two rules: don’t hit any other pillow fighters in the head, and of course, have fun. After the fight, the crowd gathered at a local pillow store to celebrate with free refreshments.